The 19th Amendment: Granting Women the Right to Vote – Political & Current Affairs Blog Published by Celeste Greig. right to vote took effect, and was formally adopted into the U.S. Constitution. It had passed earlier on June 4th, 1919 by Congress. By 1919, 15 states had already recognized women’s right to vote, the first state was Wyoming, they also elected the country’s first female governor, Nellie Taylor Ross in 1924. Woodrow Wilson was president when the 19th Amendment passed and it has been told that at the beginning he was not in favor of it. 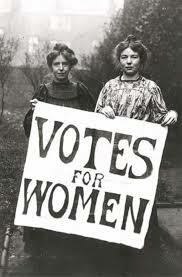 In January 1918, the women’s right to vote amendment passed Congress with the needed two-thirds majority vote, then in June 1919 it was approved by the Senate and sent to the states for ratification, of course there was intense campaigning and lobbying by thousand of women (suffragists) all around the country to secure ratification, and finally on August 18, 1920, the state of Tennessee became the 36th state to ratify the amendment, giving it the two-thirds majority of states to make it necessary to became the law of the land. Now, not every body knows that is not the federal government who needs to give approval for a passage of a Constitutional Amendment (thanks God), it takes longer and difficult, but is the duty and at the states level to do it and rightfully so. So we are so grateful to those pioneer women, who never gave up and worked so diligently and passionately for us women to exercise our right to elect, re-elect men and women and vote at any level of the electoral system, and it is a right that we should never, never take for granted.